The Triangulum Galaxy, also known as M33, is one of the closest spiral galaxies to the Milky Way. It lies 3 million light-years away, in the constellation Triangulum. The closest spiral is the Andromeda Galaxy, at a distance of 2.5 million light-years. All three are members of the Local Group, a collection of about 50 galaxies in our neighbourhood of space. The Triangulum Galaxy is formally described as a spiral galaxy with a weak (or possibly no) central bar and its loosely wound arms emanate from the galactic core. The core of the Triangulum Galaxy is a nebula – a cloud of gas and dust – called an HII region. Areas such as this are prime regions for star formation. The Triangulum Galaxy is actively making stars. Its starbirth regions scattered throughout its spiral arms. Its starbirth rate is several times more than the Andromeda Galaxy. Andromeda and the Triangulum Galaxy are linked by streams of hydrogen gas and embedded stars. The two galaxies may have had a close interaction in the past and it looks as if they will do so again in about 2.5 billion years. 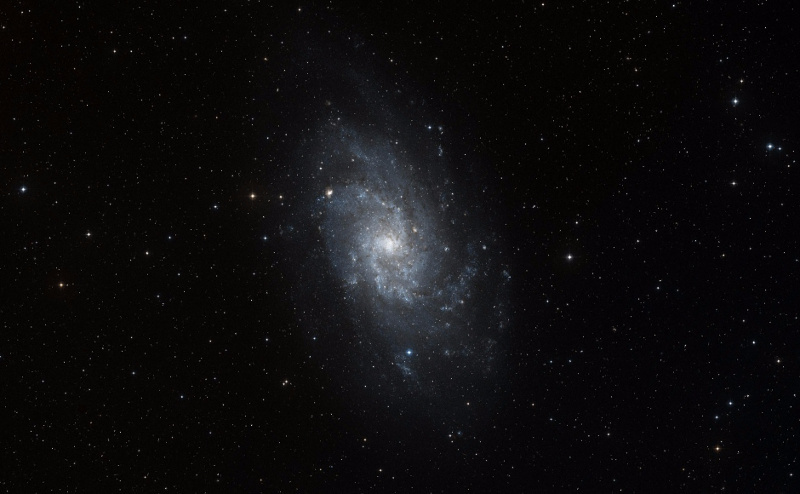 Astronomers think that a future merger between Andromeda and the Milky Way will also affect the Triangulum Galaxy, perhaps tearing it apart or cannibalising it into a larger elliptical galaxy. Some observers claim that under very dark skies, this galaxy can be seen with the naked eye. However, it is more easily spotted with binoculars or a telescope.